Only a short time after releasing their EP, Siberia, Arizona instrumental post rock band, North, bring us their more fine tuned Ruins EP. North can be easily summarized as a mix between Explosions In The Sky and Isis, though they are void of vocals, and have much shorter track lengths. Although this 28 minute disc could be a tad longer, these short songs are jammed with the most epic of sounds. The opening track “The Black Gate” showcases a darker side and sets the mood for the following five tracks, which all seem to be somewhat morbid, yet beautiful all at once. The conclusion to the first song is an explosive attack of sludgy tones, and once the barrage is over, the following track’s beauty begins, where you’ll later bear witness to that one's angst. North also has the ability to combine their heavier parts with melodic guitar leads very nicely, such as in the middle of “Nex In March” with its stomping beat, almost like a march indeed, accented by heavy hits of the floor tom which suddenly becomes less offensive as the layers of atmospheric guitars are played over the top. Sections like these are very common on this six track CD, but the battles amongst sludge and spacious guitars, amplified with serious amounts of delay, are the parts that send chills down the listener’s spine. This EP could have easily been titled Beauty And The Beast and it would have made so much sense, although it would have sounded completely stupid. The title Ruins fits this EP very well, as this album reminds me of a soundtrack to a dying planet with its melancholy dark side, and out lash of angelic and aggressive climaxes. If this record were just a tad bit longer, I’d be willing to give it close to a perfect score. It’s quite possible that these two EPs are just a taste of what’s to come and North are going to unleash a full length in the near future. Hopefully the band hasn’t taken any of my advise for the name of that album. hey, this is a great blog!! 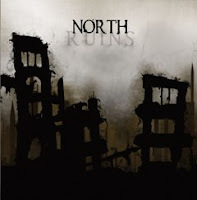 North are a really great band... i would love to get thier SIBERIA ep. could anyone help me with this?thanks, al. I just found this blog, and it's great to find so many good, detailed music reviews. I downloaded the .zip file of North's Ruins, but it's a coded file, mind letting me know what the password is?